Forgive the lengthy post, but once I started writing about Hebron, I couldn’t leave anything out. Every detail feels important for conveying the full experience. 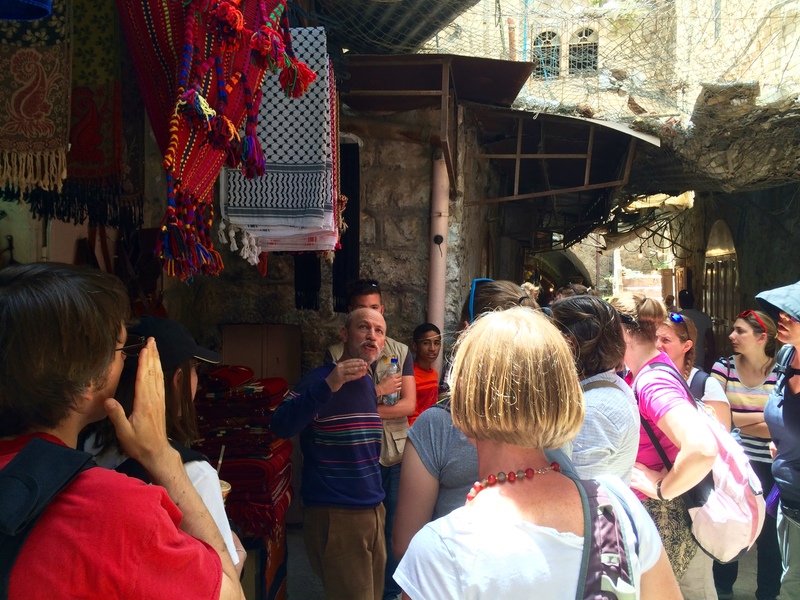 Aside from being informed that the particular Monday we visited Hebron would be an intense day, I had no idea what to expect from visiting this city. The first thing we did was visit a glass and ceramics workshop, which provided a beautiful first impression of Hebron. We got to watch the workers blow various glass vessels, throw pottery, and paint the distinctive Palestinian designs on it. The store was full of shelves upon shelves of beautiful glass goblets, perfume vials, ceramic dishes, and countless other creations. It was an introduction into an industry that is surviving despite that economic issues of the West Bank, but this was the easiest part of the day. Once we got to the main area of Hebron, things quickly changed. We were met by a volunteer from the Ecumenical Accompaniment Program in Palestine and Israel (EAPPI), a young Swedish guy named Magnus, who then led us through yet another checkpoint. We had already passed through a checkpoint to get into the West Bank, but Hebron itself is also divided between areas under Israeli control and others under the control of the Palestinian Authority. We passed through this checkpoint into an area under Israeli control because there are illegal Israeli settlements there that have cropped up in the midst of a Palestinian neighborhood. We stopped on the street just beyond the checkpoint to talk for a while. This street (unfortunately I don’t recall the name) is infamous for the number of incidents that have taken place here since Israeli settlers first came to it in the 1970s. A number of Israel flags hang along the street above closed-down Palestinian shops, and although the flags just recently appeared, anyone who tried to take them down would probably be arrested. The flags weren’t there when the EAPPI arrived in Hebron. A quick word about accompaniment: this is something we had discussed briefly as a group in our pre-trip conference calls, and which I took to essentially mean walking together with whoever we were working with, learning from them, and always remembering that Jesus is in everyone. This was not a missionary trip, but a trip about understanding what is happening to the people of Palestine, whether Christian or Muslim. The EAPPI, however, truly puts the theology into action. The volunteers of this organization are there to be international witnesses in a community rife with conflict between Israeli settlers and soldiers, and Palestinian residents. As an example, they walk to school with Palestinian children and teachers to help discourage settler harassment. Back to the infamous street. Decades ago Palestinian shopkeepers lived on this street above their stores, until the 1970s when their shop doors were welded shut as settlers moved into the neighborhood. Now it feels like a ghost town, with people walking through. We could see an IDF (Israeli Defense Force) soldier standing down on the corner by where the school was. Instead of walking directly to the corner, though, we cut up through the neighborhood a ways and then looped back down to that corner. We saw a lot of grafitti, some of which said “Free Israel”, which I found horribly ironic. Some had “Palestine” spray painted over them instead. We also passed by an archaeological site, run by the Israel Antiquities Authroity. I was already angry about the Palestinian situation in Hebron, but this made me angrier because it was clear that the excavation was being used for purely political purposes as an attempt to establish an ancient Jewish presence. I’m an archaeology student who just completed my M.A. and I was furious that something that’s supposed to be conducted as an objective science was so obviously being manipulated. It was a sucker punch by fellow archaeologists. The site wasn’t even closed off; a few kids were climbing around the ruins. Anyway, we ended up back at the corner we had seen before, across from the IDF soldier posted there. And then we learned that this soldier was posted there because there are Israeli settlers living in large apartment buildings along that section of the street and Palestinians are not allowed to walk along that part of the street. They’ve been forcefully banned from a street in their own neighborhood. Instead they have to walk along a footpath parallel to the street just to reach their own school. The absurdity of it sank in as Palestinians passed us on the path and continued on their way carryng shopping bags, while the IDF soldier watched us across the way. This is part of their life everyday and they have no choice but to conform to it. Magnus told us a story about the school on this path. A few weeks ago the children wanted to plant a tree in their schoolyard, which is surrounded by a fence and overrun by weeds. So the school had bought an olive tree to plant, and as the children and their teachers were trying to plant it, the Isreali settlers noticed and started harrassing the children, which then brought out the entire neighborhood, soldiers, and EAPPI volunteers. And all of this was because planting an olive tree in a school yard is a claim to a tiny piece of land, and it’s land that the settlers don’t want the Palestinians to have. Magnus and some of the other volunteers were chased because they were taking pictures. Apparently the tree was still there until a couple weeks before; now the schoolyard is barren again. From the school we walked to the suk, or marketplace. In many ways it was like any other suk in the Holy Land. The narrow street runs between tall buildings on either side, and shopkeepers bekon from behind stalls of fruit, spices, scarves, and other goods. There the similarities end. In this case many of the buildings are now the homes of settlers, and shopkeepers have strung up tarps and chainlink high above the street to help keep trash and other debris from falling on the goods and customers. Settlers throw down trash, debris, liquids, and in extreme occurences feces and even acid, all in attempts to drive the Palestinian shopkeepers out. The street smells slighlty of sewage, and I tried not to think too much about what wet areas of the pavement might be. Sadly this all happens under the watch of the IDF soldiers, who are there to protect the settlers, but will only intervene in fights and riots. Despite all of this, the shopkeepers seem determined to stay. Finally, we made our way to lunch where a Palestinian family hosted us (all of this had happened before lunch!). They’d made an enormous pot of rice and chicken, which was delicious. The three kids helped their parents and gave use water and utensils, and insisted on second helpings for everyone. They spoke a little English, and we found out the oldest boy was 15, his brother was 13, and their sister was younger. I thought back to what my brother looked like when he was 15 and their was no comparison – these kids were skinny and small. I might have guessed the 15 year old was at least two years younger. I happened to be sitting on the couch next to their room, and the door was open. Inside were three neatly made twin beds, each with a colorful cartoon character comforter. But that was all there was. Maybe it was because they had guests and had put everything else away, but there was no other furniture, not even a nightstand or a chest of drawers. No stuffed animals, no posters. But these kids seemed thrilled to have visitors. They listened attentively while their father spoke to us about the group he leads, Youth Against Settlers, which promotes non-violent protest measures, even though they didn’t have chairs because they’d given all the seating to their guests. They waved goodbye to us. For me it was a heartwrenching meal, and incredibly eye opening. It was difficult enough to try to process what Magnus had told us that morning about daily Palestinian life in Hebron, but meeting a family who lived in the middle of this conflict and yet graciously opened their home to us was truly to feel God at work in them and in us. So, that was my experience in Hebron. It was a lot to take in at the time, and even now, nearly a month later, I felt I needed to express all the details to explain why this day was so intense, and why I still feel so strongly about it. Emily Prosch recently graduated from the University of Arizona with a Masters Degree in Archeology. She’s currently on an excavation project in Greece.